Men’s JOKER calls itself the “trumpcard for the man who is a styling switchboard…” It targets company men in their twenties and thirties. Many of its fashion tips are modeled on fashion worn by Hollywood stars or celebrities, making it clearly a “follow me” kind of magazine which avoids anything edgy or radical. It especially focuses on “safe”, “middle of the road” and inexpensive brands like GAP. Men’s JOKER has a circulation of 200,000. Published by Bestsellers which also publishes street Jack, Udetokei Ou (Wristwatch King), CIRCUS, Ikkojin (Individual), The Best Magazine, OPUS, Love Seoul, Coccolo and many others. IMPORTANT TIP: How to buy Japanese fashion magazines online. 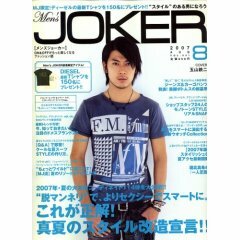 where can i buy this MEN’S JOKER JAPANESE MEN FASHION MAGAZINE at Hong Kong? I don’t know of any shops, although there are probably some. But you can purchase it online at Amazon Japan. Click through to the product page to see a link for English explanations.